This convenient kit features Felt Alive Needle Felting Wool and Felt Alive Color-Coded Felting Needles. 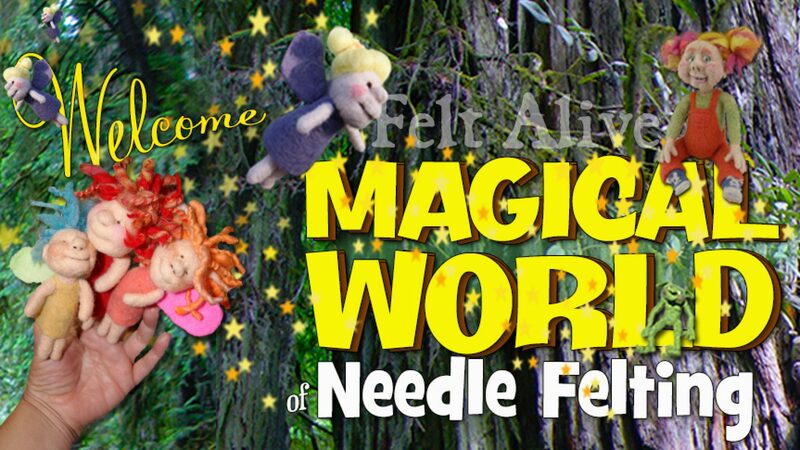 includes wool, felting needles & supplies enough to create at least three 3″- 4″ Pixies. Approximately 2 oz of Felt Alive Needle Felting Wool – this batting is the same wool I use in the video. You will be amazed at how fast and easy it is to felt. Your kit includes two different skin tones plus three different colors. Wool for tiny details – brown for the eyes – pink for blush and some white wool in case you want to make teeth. Two single point Felt Alive Felting Needles – this kit includes our new Orange Beginner Felting Needles. They work just as well as the yellow needles you see me using in the video but they are stronger and don’t break as easily, making them a perfect choice for beginners. A small foam felting pad (approximately 4″x 4″). Felt Alive Needle Felting Video Tutorial – PIXIES! Using only wool and barbed felting needles, learn the the secrets of sculptural needle felting! No Wire Armatures – No Sewing – No Stuffing – Just Needle Felted Wool!! Learning how to make needle felted Pixies is a perfect introduction to the magic of soft sculptural needle felting. Using our needle felting kit makes it even easier! In this 2 hour long workshop, you’ll learn simple techniques for needle felted faces and when the wool blushes and smiles at you, you’ll be hooked on needle felting forever! You will also learn techniques to needle felt simple bodies that stand on their own and the lessons on making a hat is invaluable. Make one or many! Each one will be unique and lovable.